I really don’t know if this will count towards my Heavenly Cake bake-a-long. Mainly because I adapted so much of this recipe at the end, I feel like I actually ended up doing something totally different than the original. The background of this cake is simple. One of my best friends birthday was coming up. Her boyfriend, who is an avid cook like me, sent me an email and asked me if I be willing to bake her the birthday cake. At the same time this was happening I was already thinking of offering my baking services to the cause. I love when the universe works all of these tweaks and everyone ends up getting what they what. After a bit of investigating efforts of the boyfriend, we narrow it down to her favorite cake being carrot cake. Which was perfect for me, since I had not baked the carrot cake when it was in rotation, so again win-win. But, I was not convinced… I wanted the cake to have a spice flavor profile and I felt that I needed a bit more. I also wanted to make sure it was moist, most of the carrot cakes tend be a bit dry, so I thought why not combine a bit of oil and melted butter? I also wanted to do without the raisin, I know, I know the classic has raisins on it, but I hate raisins on cakes, so they were out and instead mixed in walnuts, lots of them too. Then when I was looking at my spice rack I found an old bottle full of crystallized ginger – and told myself, why not? (The best decision EVER!). I also went with some ground cloves, freshly grated nutmeg and then because it was right next to me in my fruit basked while I was mixing the batter, some grated orange zest. I honestly have to say that I totally flew by the seat of my pants on this one. But the results… oh my… the results! The birthday girl was static with the cake, and most of the guest loved it as well. I’m not a huge fan of carrot cake to begin with, but this cake just won me over. It’s not too sweet, you can taste a bit of everything that went into it and I paired it up with a white chocolate cream cheese frosting, which had a bit of tang to it, making it a perfect “tone-me-down” of the spicy cake. Preheat the oven to 350F. Prepare two 9 by 2-inch round cake pans encircled with cake strips, bottoms coated with shortening, topped with parchment rounds, then coated with baking spray with flour. In a medium bowl incorporate all the dry ingredients – flour, baking powder, baking soda, salt, cinnamon, nutmeg, ginger and cloves. Whisk together until blended, and set aside. In a bowl of an electric mixer, using the paddle attachment (or hand held mixer), beat the eggs and both of the white and light brown sugar in medium speed until combined (about 2 minutes). At low speed, add the oil, melted butter, heavy cream, vanilla extract, chopped crystallized ginger and orange zest and mix until blended. Stop the mixer and scrapped down the sides of the bowl from time to time with a spatula. Add the flour mixture in three additions, mixing just until blended. Add the carrots and walnuts and mix until blended. At this point the batter is very watery, don’t worry, it’s suppose to look like that. Divide the batter equally into the prepare pans. Bake the cakes for 25 to 30 minutes, until they are dark golden brown and cake tester in the center comes out clean. Cool the cakes in the pan on wire racks for 15 minutes. Then invert onto the racks and cool completely. TIP: I baked my cakes the day before frosting them, mainly because I really wanted them to be very cold when I applied the frosting to them. Once they were completely cool, I wrapped each layer in cling wrap and placed in the refrigerator overnight, to firm up. 3.5 ounces (100 gr) of white chocolate (make sure is very high quality). Melt the white chocolate in the microwave in bursts of 30 seconds, checking it and stirring until smooth and fully melted (its ok to have some pieces, as you stir they will melt). Set aside to cool slightly. In a bowl of an electric mixer, using the paddle attachment, beat the cream cheese and butter at medium speed until smooth and creamy, about 1 minute. Add the melted white chocolate and mix until blended. Add the lime juice, vanilla extract, and confectioners’ sugar and mix until blended. Increase the speed to high and beat until smooth and creamy, about 1 to 2 minutes. To decorate the cake - Removed the cake layers from the refrigerator and place one of the layers right side up on a serving plate or cardboard cake round. Spread the top of the cake with about 1 cup of the frosting and spread out, fully covering the round. Top with the second layer, upside down. Since this was going to be a birthday cake, I wanted the frosting to be super smooth, in order to do this, I crumb coated the cake first, and place in the freezer for about 15-20 minutes for it to firm up. Then I finished up by frosting the top and the sides of the cake with the remaining frosting. If you are going to serve the cake, leave out to bring to room temperature, if not, then place back in the refrigerator. As you can see the cake is rich, spicy and tremendously moist, but at the same time not crumbly. While most like it a room temperature, today I tried a bit of left over and it was just as good cold. Whatever temperature you like it in, the results are amazing. 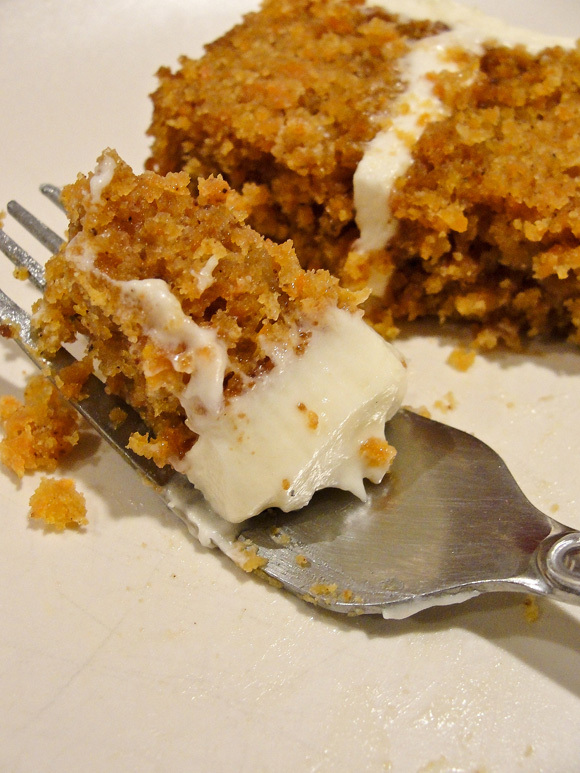 I dare you to try it and watch it become your go to carrot cake recipe. And I’m totally marking it off as my Carrot Cake choice for Heavenly Cake Baker, it was after all the recipe that inspired it.